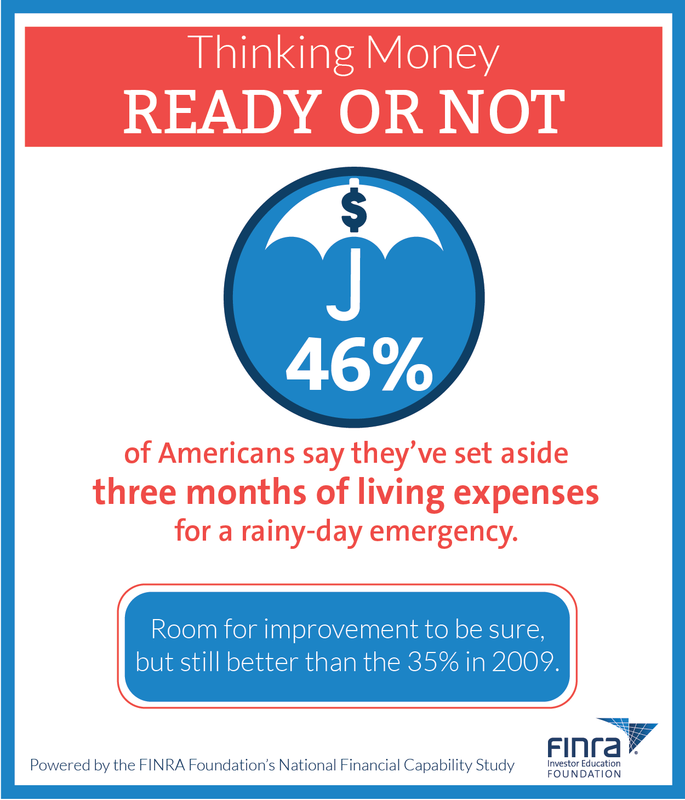 As you prepare to invest, it's important to set aside some money—about the equivalent of 3 to 6 months' of living expenses—in an emergency fund. There are times when people become ill or are injured in accidents. Employers lay off workers. If something unexpected happens to you, having the money you need to pay the medical bills or see you through the weeks or even months of being out of work will help to keep you out of debt. If you already have investments, an emergency fund also will help you meet your expenses without disrupting your investment plan. The best place for your emergency fund is in a liquid (easily accessible) account. A liquid account might be a regular savings account at a bank or credit union that provides some return on your deposit, and from which your funds can still be withdrawn at any time without penalty. To earn a slightly higher interest rate, some people choose a certificate of deposit, or CD, for their emergency fund, or a series of CDs of approximately equal value, with one maturing every six months or every year. This approach is called laddering. You can roll over the CDs as they mature, to keep your ladder intact. The loss of interest you face for taking money out early may motivate you to keep your fund intact. But in a real emergency, the interest you may lose is a small price to pay for having the money you need. And if you have to spend any of the money, you should plan to replace it. You might also consider buying U.S. Treasury bills with some of your emergency fund money. They, too, can be timed to mature on a regular schedule and, like CDs, they tend to pay more interest than a simple savings account. And while they aren't bank products, they are backed by the federal government. That means there is no risk of losing principal if you hold them to maturity. U.S. Treasury bills have very short terms—4 weeks, 13 weeks, or 26 weeks. Other options for an emergency fund include money market mutual funds. A money market mutual fund is a mutual fund that must, by law, invest in low-risk securities, such as government securities and certificates of deposits. Compared with other types of mutual funds, money market funds are highly liquid, low-risk securities. Unlike money market deposit accounts, money market funds are not federally insured. While they are intended to pay dividends that are comparable to prevailing short-term interest rates, they can lose value.